Cloud technologies are, however, key to any aspect of Digital Transformation. One year ago, I wondered what systems would be eligible for movement to the Cloud. Using ERP, CRM, ECM, and other systems in this manner seemed easy. 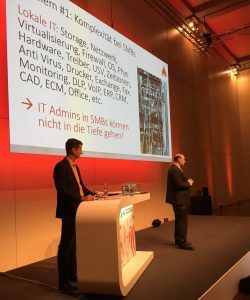 SaaS (software as a service) does not pose a problem in this case, but what about CAD and simulation? To find an answer, I contacted our Autodesk regional manager, Dennis Lemm. He invited me to visit HMI (Hannover Messe Industrie) in Hanover last year. I was really amazed to learn that Autodesk’s Fusion 360 was already available in the Cloud. I downloaded Fusion 360 to try it with my Microsoft Surface tablet. It performed very well on such a small machine. This is when a close, multi-level discussion with the Autodesk team started. Last year, Karl Osti invited me to speak at the Financial Times Executive Meeting in Berlin about my digital journey and how the Mittelstand can benefit as a result (find my experiences HERE). Dr. Ralf Freund I also like to thank Alexander Buschek for his insightful and inspiring presentation. We all learned a lot about the view of a forward-looking CIO/CDO about cloud technology and the digital transformation. Really excellent! 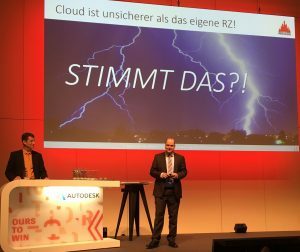 Because I established the digital strategy in my company, Autodesk asked me to speak about our Cloud strategy and my personal journey at the OTx One Team Extension EMEA conference in Berlin, a huge event with more than 2,000 participants from all over Europe. Our data on premises are not as safe and secure as we may think (see my article HERE). How can your design department benefit from the Cloud by using Fusion 360? I ended my speech with a remark that disruption is everywhere. Channel partners from Autodesk are subject to disruption, as is any other industry. Inventor requires a lot of technical knowledge to install or deploy in a bigger environment. With Fusion 360, these skills are no longer in demand. The same is true for server skills. When businesses don’t use on premises software, there is no need to install and maintain servers. In order to keep from following Kodak’s downward path, businesses in all industries need to assess their situation and understand whether the products or services they offer—some, for many years now—will be in demand down the road. See my article Why Digital Optimization And Industry 4.0 Is Not Enough! After my presentation, we had a vivid discussion on various aspects of Cloud technology at Autodesk. It was a thought-provoking speech, and many from the audience approached me after the session, either in person or via LinkedIn. The purpose of this blog is to start a discussion. Please leave your comments, whether you agree or if you disagree. I hope to hear from you! Alexander Buschek is passionate about Digital Transformation and the opportunities it gives businesses—especially MSEs. He is convinced that every business has to embrace Digital Transformation in one way or another in order to survive. The sooner a business begins its Digital Transformation, the better. 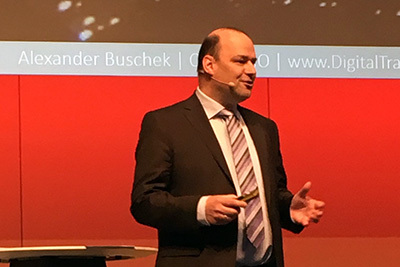 Alexander was the CIO / CDO of Braunschweiger Flammenfilter and CIO of Cherry GmbH. Prior to that he was an entrepreneur, consulting MSEs about IT strategies, providing external project management, and overseeing various IT projects (e.g. ERP and CAD implementation and migration). Working with many MSEs gave him a deep understanding of this market. Alexander is now Senior Director, Analyst (MSE) at Gartner. Disruption is where you don’t expect it! Article on Digital Transformation with focus on SMBs. Feel free, please, to pass it on if you find it useful. I would also be happy to hear your comments. Click on the image to download the document.